PartyWizz is delighted to be able to provide the authentic Santa Claus this festive season. Whether it be a Corporate family day, Office 'Secret Santa', House visit for the kids or even a Dinner Party for Adults!, be sure to add some real Christmas cheer to the occasion. Santa will arrive ringing his bell, talk to all the kids (and Adults), check his 'Naughty & Nice' list and give out prezzies you provide, with plenty of time for photos too! "An amazing Santa loved by kids AND Adults! Really knows how to make the visit fun and memorable. We wouldn't book anyone else! " 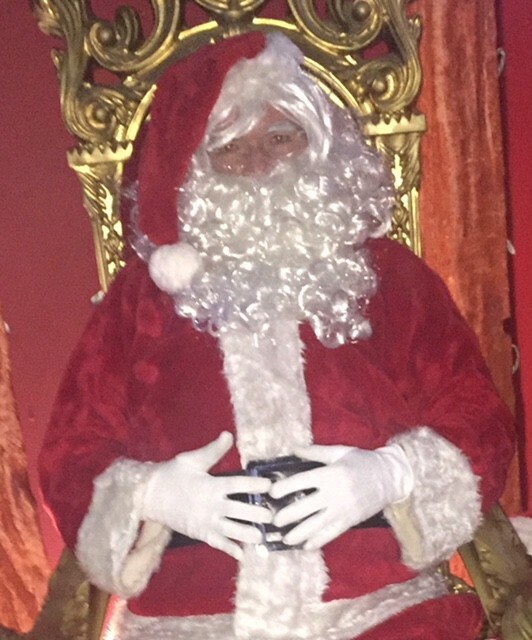 "I booked Santa for a home visit for a Children's Christmas Party and it was the best Santa experience we have ever had !...So, I booked him to make a surprise appearance at a Christmas Dinner Party (Adults) and he brought the house down! " "We booked Santa to arrive and hand out the prezzies for our 'Secret Santa'. We couldn't have imagined how good Santa would be! He had something funny to say about everyone! Best idea ever! People still talk about it! " "Our annual resident Santa in 'The Goat'...We wouldn't use anyone else! Sees all the kids then spends time with customers chatting and getting pictures. " "We booked Santa to deliver our Corporate Gifts to clients. The feedback from our customers was amazing. I can honestly say it was the best money we every spent!"